Oregon City's Max Reed tweaked his race strategy Wednesday, going out a little slower than usual and finishing faster than ever. Reed withstood a strong challenge from Tigard's Cole Grieb and finished in a personal best 16 minutes, 29.72 seconds to win the boys' varsity race at Wednesday's Three Rivers League cross country meet with Lakeridge and Tigard at Oregon City High School. Oregon City's Sam Brito nipped Lakeridge's Evan Wheeler at the finish line in the race for third place, and the next three OC runners placed among the top 11 finishers to help the Pioneers sweep the double dual, beating Lakeridge 23-32 and Tigard 19-41. "That was exciting from my end," Pioneers coach Brandon Lee said. 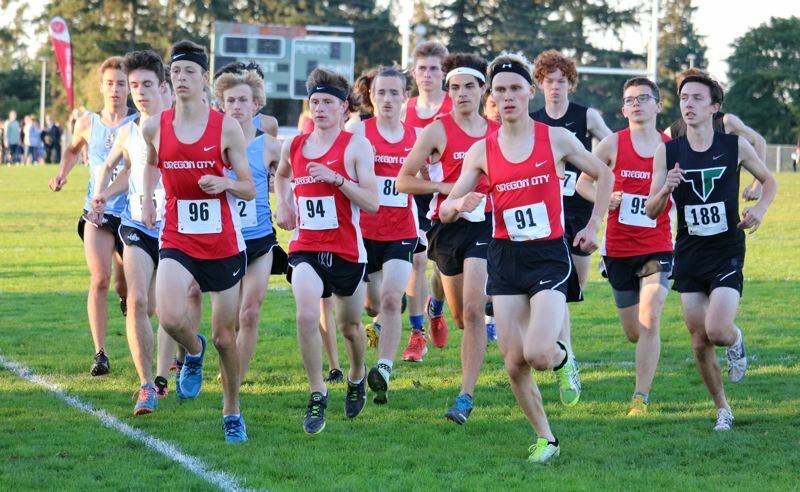 "I know the boys were pretty pumped up after last week's race with West Linn and the times they ran, so coming back on this same course and knowing how fast it is, they were gung-ho." Reed, one of four juniors on Oregon City's current varsity roster, went into Wednesday's race seeded third behind Tigard's Oscar Nieves Lira and Lakeridge's Wheeler. But Nieves Lira skipped the race because of an illness, and Wheeler was a little off his game, leaving the door open for Reed to dictate how the race over the Pioneers' 3.1-mile home course would be run. "I was really excited for this race," Reed said. "I really like running on this course, because it has a good downhill, a steep uphill, and I feel like it's just made for me. It's just home. "This week, I kind of went out slower, because I've been going out fast every, single meet. Today I ran a 5:12 first mile and I usually average about a 5:08 or 5:09, but it felt good and then I definitely picked it up on the second mile of the race. Near the end of the first mile, it was still a three-man race with Reed, Grieb, and Wheeler running side-by-side. By the end of the second, it was a two-man race with Reed looking to break away from Grieb. "Cole really pushed me," Reed said of the Tigers' senior, who finished in a season's best 16:30.5. "The last mile, I'd push ahead, he'd catch back up, and my legs wanted me to give up, but I kept going and going and I ended up beating him at the end. "If he would have pulled out ahead of me, I'm not sure my legs could have handled it. But I had an extra gear today." Reed trimmed for than 10 seconds off his previous season best of 16:36.9 set a week earlier against West Linn and he climbed two spots to No. 6 among this season's top-ranked Three Rivers League runners. The top three teams in each district meet plus any individual in the top seven not a member of a qualifying team advance to the Nov. 3 OSAA state championships at Lane Community College in Eugene. "I was nervous going into the race but I knew that I could do what I did, because that's how I need to finish if I want to go to state," Reed said. "I knew that if I beat Evan, that could be a good indicator of where I stand, and I'm always looking for that because my ultimate goal is to go to state." Jonathan Schaffer placed fifth in 16:51.27, Grant Pauli was seventh in a personal best 19:57.85, and Trevor Ritcher was 11th in a career-best 17:31.3, rounding out Oregon City's top five in the Pioneers' final tune-up before the Oct. 24 Three Rivers League championships at nearby Clackamas Community College. "We don't race this weekend as there are two weeks until the district meet, so we've got time to fine-tune things and get the rest we need if needed," Lee said. "We're excited about districts." West Linn is the pre-race favorite to win a fourth boys' district title in five seasons, with Tualatin a close second, Oregon City third, and Lakeridge fourth. "Lakeridge is a tough team and they've got a great coach and I expect them to run hot at district," Lee said. "It's not going to be a cakewalk. We'll be ready for them, though, and for everybody." Said Brito, the Pioneers' senior: "I know we can get third and maybe even challenge Tualatin, but we've just got to be careful and not get too cocky about beating Lakeridge. We've just got to keep doing what we're doing and, hopefully, we'll get there. "We've yet to peak. This next race, maybe we'll just throw it all on the line, but there's always room for improvement." In Wednesday's girls' race, St. Mary's Academy's Fiona Lenth won in 18:39.44, teammate Sarah Lyell finished second in 18:48.66, and the Blue put four other runners in the top seven to sweep all three dual races. Oregon City's Katie Schroeder ran a season's best 21:29.79 to place 16th overall, while Shaylee Cooper ran a career-best 21:35.96 to finish 17th. Brynne Shroufe finished 21st in a season's best 21:57.53, Ellen Crooks was 25th in a personal best 22:29.90, and Makenna Palumbo placed 26th in a season's best 22:34.81 for the Pioneers.